#037 Do You Have The Gift of Evangelism? | That's In The Bible? #037 Do You Have The Gift of Evangelism? Simply put, Evangelism is giving the gospel to an individual or a group of people; with the hope they will get saved. This includes witnessing, passing out tracts, open air preaching, etc. As with many Bible subjects there are opposing views on how this should be done, who should do it, or whether it should be done at all. What does the Bible actually say? Do You Have the Gift of Evangelism? Many of God’s people today are intrigued with the subject of Spiritual Gifts. Often, they are interested in discovering their spiritual gifts, and I suppose that is a natural thing. To be sure spiritual gifts are Scriptural. They are however, often misunderstood and misinterpreted. In Lesson #27, Steve did a good job in helping you to sort through the improper application of spiritual gifts, and if you have an interest in the subject, I recommend you listen to Lesson 27, “Fruits, Gifts, Signs”. In regard to the subject at hand, today we want to examine the question, “Do You Have the Gift of Evangelism”. Before delving into the question, let’s be sure you understand what I’m talking about. Webster immediately associates evangelism with the gospel. In fact, the word “evangelize” comes from the Greek word for gospel. That is a linguistic fact, not a textual argument one way or the other. Simply put, Evangelism is giving the gospel to an individual or a group of people; with the hope they will get saved. This includes witnessing, passing out tracts, open air preaching, etc. As with many Bible subjects there are opposing views on how this should be done, who should do it, or whether it should be done at all. Some believe it should only be done when the unsaved person brings up the subject. These people subscribe to what’s called Lifestyle Evangelism. Some people believe it shouldn’t be done at all because it’s offensive and people don’t want to hear it. Some believe it’s only the preacher, pastor, missionary or evangelist’s job to witness. Some believe evangelism is exclusively the work of those who have been gifted to do so by God. Let’s look at each of these positions. 1.) Lifestyle evangelism  You just live the Christian life in front of people and wait for them to be impressed by the difference in your life and ask you about it. A.) If that were the only way to evangelize, we would NEVER reach the world with the gospel! For rarely does it happen this way. It may happen, but people that get saved that way are by and large the exception and NOT the rule. This brings us to the essence of our title question. 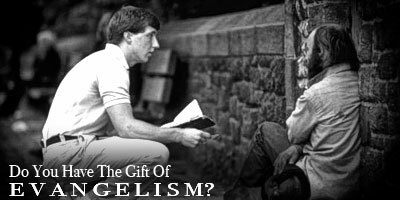 Do You Have the Gift of Evangelism? b) If you don’t have the gift of evangelism, you should leave evangelizing to others who are gifted in that area. To answer the question we should first note one very important thing. I. In all of the Bible references to spiritual gifts Evangelism is NEVER listed as one of the gifts. Check it for yourself. Read I Cor. 12:4-11 & I Cor. 12:28 & I Cor. 12:29-30. II. If Evangelism was a gift, it would still be available to all that desire it. I Cor. 14:1 tells us to “desire spiritual gifts”. I Cor. 12:31 tells us to “covet earnestly the best gifts”. If there were such a thing as the gift of evangelism, it would certainly be one of the best gifts, being able to give people the gospel so they can be saved from hell. Now, again, this point is just hypothetical for it’s clear that evangelism is not a spiritual gift in the listing of the spiritual gifts in the Bible. III You do NOT need a “Gift of Evangelism” because you have a Command of Evangelism. As a matter of fact, you have several! We have already considered Acts 1:8. How about Mark 16:15? IV It is, in fact, the responsibility of every Christian to witness! Acts 8:1,4-5, 12, 25, 35, 40 – These verses show that it’s the job of every Christian to witness, not just the leaders of the church. Are you part of the bride? Are you reaching out to a lost and dying world and saying “Come. And… take the water of life freely”? How ‘bout you; are you following His example? Friends, DON’T be ashamed of Jesus and the gospel. “Stand up stand up for Jesus, ye soldiers of the cross! a.) Because He commands us to witness. We have looked at a number of those commands. This is reason enough to witness. He is God, we are His people, what He says goes! b.) Because of our love and appreciation for what God has done for us. (II Cor. 5:14-15, 18-20). b.) The Saved – By witnessing to the lost, you can also be an encouragement to the saved. In your witnessing, you may encounter a saved person and be able to lead them to the assurance of their salvation and/or to a closer walk with the Lord. They may not be attending a church and you can invite them to yours. Additionally it often encourages other Christians in your church and in public, when they see someone else witnessing. This may embolden them to be a witness also. a.) Witnessing stirs up the Holy Spirit inside the Christian for the Spirit desires to exalt Jesus (John 16:13-14). When you get filled with the Spirit you get all the benefits of the fruit of the Spirit (Gal. 5:22-23). b.) As we said before, witnessing is also part of the Christian’s armour (Eph. 6:15). It helps keep you protected from the adversary. If you do not witness you do not have on the whole armour of God and you are more vulnerable to Satan’s attacks. Let me also say that every Christian has the capacity or ability to witness… They just need to turn it loose! A. Give Your Testimony – If you don’t know how to tell them anything else, you can always tell them how you got saved. Paul did this more than once in the book of Acts (Acts 22:1-16; 26:1-18). B. You Can Bring Them to Someone Else Who Can Lead Them to the Lord – The woman at the well did this (John 4:28-30). In the parable of the sower the sower sowed the word of God (Mark 4:14). In Isaiah 55:11 God promises that He will use His word to accomplish His purpose. The word of God has the power to save the soul (James 1:21), and many people have been saved by reading gospel tracts and then calling upon the Lord for salvation. D.	Learn to Present the Plan of Salvation – Ultimately, you should learn how to be able to lead someone to the Lord yourself. If you don’t do this, you will miss opportunities to help somebody get saved; and someone that you could have led to the Lord may instead never get saved and go to hell. This will help you keep things in order in your mind so you will know what you are trying to establish with each point, and then, where to go next. When you witness, explain each point clearly. As you get comfortable with this, you will be able to add more Scriptures to support any given point. *Try to go out witnessing with someone who knows how to lead a person to the Lord and learn from them. The opportunities and places for witnessing are as vast as the world and its population. If you will pray and look for opportunities to witness, you will find them. You can witness to relatives, friends, neighbors, workmates or classmates. You can go up to someone you’ve never met before, engage them in a conversation and begin to witness. A good way to turn a conversation to witnessing is by A.) passing out a tract; or B.) asking the person a simple question that can go something like this, “If you were to die today, are you 100 percent sure you would go to heaven?” If he is not, ask him if he’d like to know he was going to heaven? If he would, ask him if you could take a moment and tell him. If he says yes, go to it! Even if the person says no, you still might be able to keep the conversation going and get some witnessing done. Even if you can’t get someone saved right there on the spot, you can plant a seed that might bring forth fruit at a later time (I Cor. 3:6). In addition to witnessing whenever the opportunity arises, it was the practice of the early church to go out in an organized fashion. Jesus sent out His disciples by twos providing us with a good example for organized witnessing (Mark 6:7 with Luke 9:1-2). The apostle Paul in Acts 20:20 set another example for us when he declared he witnessed “publickly, and from house to house”. One has only to look at the next verse (Acts 20:21) to find out what Paul was telling them on these occasions. How far have you followed the Lord? That is, the reason God gave evangelists, pastors and teachers was for the perfecting of the saints. This entry was posted on July 9, 2010 at 12:17 pm and is filed under That's In The Bible - Podcast. You can follow any responses to this entry through the RSS 2.0 feed. You can leave a response, or trackback from your own site. Awww, now you jest left off from preachin’ an’ done gone to meddlin’! Thank you saints for the rebuke to get busy & not be weary in well doing. I look forward to these broadcasts via itunes and thank you all VERY much for your valuable time & effort in lifting up “the standard”. I, for one am very appreciative. will really love to get updates and get new teachings from you as the little i read strengthened me and has added to my teaching others. thanks a lot.